Welcome to OARS’ seven day California Paddle Guide School! We aim to teach you everything you need to know about river guiding; prior experience is not a prerequisite. If you are in good shape, have a positive attitude and want to learn wilderness skills in an outdoor setting, you will have a memorable experience and gain new skills that will last a lifetime. This course is designed for those hoping to become professional river guides, as well as those wanting to safely guide their own private river trips. Our California Guide School is taught by our on-river managers and professional guides, each one passionate about whitewater rafting, river safety and sharing their knowledge with you. This school provides the setting for participants to be able to competently maneuver rafts in intermediate Class III-IV whitewater, as well as training in basic whitewater rescue techniques. Our instruction focuses on captaining a paddle raft, giving you a strong foundation from which to build your whitewater guiding skills. 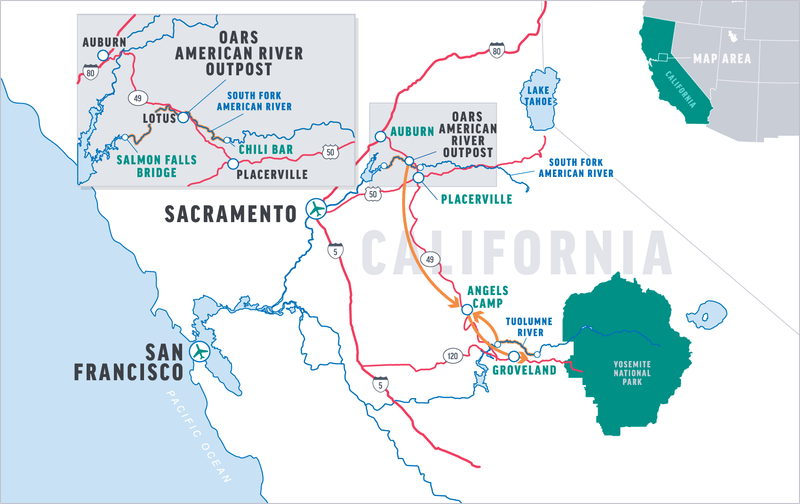 Your course is based out of the OARS American River Outpost along the South Fork of the American River. The first day is your introduction to whitewater rafting. River hydrology and safety considerations will be introduced, as well as the equipment necessary for a successful rafting expedition and how to properly care for it. On our first afternoon, we will take a 25-minute shuttle ride to the Chili Bar put-in point where your instructors will demonstrate a “paddle talk” and how to rig the boat. Your instructors will guide the majority of the rapids on this day, but don’t be surprised if you’re asked to flip the boat over, swim a class II rapid, or try captaining the boat yourself without a paddle. Each morning, the breakfast crew is up and ready by 6:30 AM preparing a warm meal for everyone. Once breakfast is cleaned up, we’ll head off downstream to get more practice navigating class I-III whitewater. Be ready for some laughs, some frustration, and an overall good time as everyone learns how to steer the raft from the back of the boat. We’ll take turns as paddlers and paddle-captains as we gain experience in understanding the hydraulics of the river, learning how to use your crew to assist in maneuvering your boat, and practicing river rescue techniques. As the course progresses, we will increase the river miles we raft each day up to the maximum of 21 miles. This allows everyone to get plenty of “stick time” and the benefit of seeing the river multiple times. As you grow in confidence throughout the week, your instructors will step back and allow you to “Trip Lead” the trip. From giving the safety talk in the morning to properly loading the gear at takeout for the drive back to camp, it will be on you and your classmates to work together to get it done. In the evening, we will debrief the day, laugh about all the fun stories, and prepare dinner. Expect the days to be long and dinner/instruction to be done around 8:00 PM. Depending on water flows and group skills, we may journey to other California rivers such as the Class IV Middle Fork of the American River, to continue to hone techniques learned through the previous five days. Your instructors will expertly guide you through the big, Class IV rapids while you put your skills to the test as you “read and run” a new waterway. Many find this day challenging and rewarding all at the same time. On our last day, we’ll run the Chili Bar section one last time. This is considered the more difficult section on the South Fork American River and you should be patting yourself on the back for a job well done. Back at camp, we’ll enjoy our final lunch and your instructors will sit down with each student to provide feedback and a performance evaluation for the week. The course will conclude around 4:00 PM. 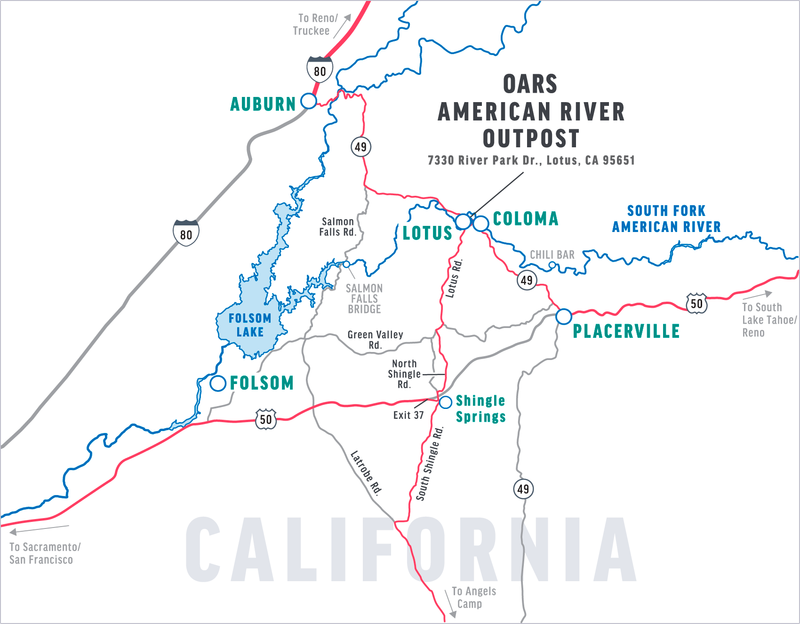 Our meeting place and the location for OARS’ California Guide School is at the OARS American River Outpost in Lotus/Coloma. The School starts at 8:00 AM. At this time we will introduce your instructors, you will meet the rest of your fellow students and we will jump right into learning! Click here for a Google Map. From Sacramento on U.S. Hwy 50: Follow Hwy 50 east toward Placerville and South Lake Tahoe. Take the Ponderosa Road exit (Exit #37), turn left onto Ponderosa/S. Shingle Road and cross over the freeway. At the second stop light, take the right turn on N. Shingle Road toward Coloma/LotusAfter about 4.5 miles N. Shingle Road turns into Lotus Road—continue going straight for about 6 more miles. As you approach Lotus, pass through the town’s first stop sign and continue to the 3-way stop sign intersection with Hwy 49. Turn left onto Hwy 49 (north) and cross the bridge over the South Fork of the American. Right after crossing the river, you will see the “River Park” shopping center on the left, with signs for Hotshot Imaging. Please use the center’s second entrance, where a left-turn lane is provided at River Park Drive. Look to the back of the shopping center, where you will see the entrance to our American River Outpost. From Placerville: Proceed north on winding Hwy 49 for about 9.5 miles (about 20—25 minutes) through the town of Coloma. Just past Coloma and the Marshall Gold Discovery State Historic Park, cross the bridge over the South Fork of the American. Right after crossing the river, you will see the “River Park” shopping center on the left, with signs for Hotshot Imaging. Please use the center’s second entrance, where a left-turn lane is provided at River Park Drive. Look to the back of the shopping center, where you will see the entrance to our campground. These are approximate mileage and driving times and do not take into account any delays. Please allow yourself extra driving time. If you’re arriving by car, parking is available at the OARS American River Outpost. Many people enjoy the time saved by flying into Sacramento (SMF), which is served by most major airlines. A variety of car rental companies are available at the airport. Weekly rentals are often an inexpensive option. Oakland (OAK) and San Francisco (SFO) are also nearby airports, and are approximately 2.5-3 hours away from Coloma. Amtrak offers service to the nearby town of Auburn. Please note, car rentals are not available in Auburn. On the final day of your guide school, you will be returned via shuttle to the OARS American River Outpost. You should arrive back by approximately 4:00 PM. Riverside camping is available at the OARS American River Outpost. Please ask us about the details—you must reserve ahead of time. The water on the South Fork and Middle Fork of the American Rivers is released during the summer months from hydroelectric facilities located upstream. Such water releases are not subject to the control of El Dorado County or commercial rafting companies. It is important for our guests to understand, the water flow on these rivers is directly related to demand for hydropower. The guides are “tuned-in” to the water release schedule and will adjust the logistics of each trip to maximize the whitewater excitement. Our ‘classroom’ extends from the river, to our riverside kitchens, to time around the campfire learning from our veteran guides. At the OARS American River Outpost, there are hot showers, running water, and a few public outlets for you to charge your electronic devices. On the first night in camp, a crew member will give a demonstration on setting up a tent, which you’ll see is quick and easy. The meals we serve are hearty and delicious, comprised of fresh ingredients and a variety of foods. A typical morning might start with French toast, bacon, fruit, orange juice and coffee or tea. Lunch could include a delicious spread of cold cuts and cheeses with several types of bread or pitas stuffed with veggies and hummus. There are always cookies and a cooling drink to top it off. Dinner might be steaks, salmon, chicken enchiladas, or a delicious pasta dish. Dinner generally includes a salad; desserts are frequent. Hors d’oeuvres are also included as part of the menu. During the guide school, cook teams of students with instructors will take turns preparing and presenting the meals. We provide plenty of water and lemonade and two sodas per person per day. You are welcome to bring your own favorite beverages, alcoholic (assuming you are at least 21 years of age) or non-alcoholic, in non-glass containers. For your safety and the safety of others, alcoholic beverages are limited to evening enjoyment, after instruction is over. We carry sufficient drinking water with us to provide for your needs throughout the trip. Water jugs for refilling personal water bottles are accessible in camp, at lunch time and before hikes. The OARS American River Outpost has hot showers and flush toilets for our use. If we travel to other rivers, we will camp in developed campgrounds with access to toilets. If we are camping anywhere other than in Coloma/Lotus, we recommend using a liquid biodegradable soap such as Campsuds or Dr. Bronner’s (www.drbronner.com), which can be purchased in most stores that have a camping section. These soaps can also be used to wash clothes. Disposable anti-bacterial towelettes (Coleman Swash Cloths™, baby wipes, etc.) can be used as an alternative; they are especially convenient for spring trips. Even if you aren’t anticipating your menstrual period, come prepared for it. We recommend you bring some sandwich-size zip-loc™ bags. These bags can be used to store feminine products during the day while you are on the river and can be disposed of when you reach camp. (For tampon users: o.b. ® tampons are ⅓ the size of regular tampons, tuck discreetly into pockets and have less paper wrapping.) Many women suggest bringing a small supply of baby wipes. We provide some feminine products on most trips for emergencies. You may want to bring a small waterproof bag to hold your camera and other items you might need during the day. While most rafting-specific bags are designed to be waterproof, you may also wish to place your camera in a durable, waterproof casing for additional protection. We also strongly recommend you take out a rider on your homeowner’s policy to cover your camera—especially if it’s fine equipment. Make sure to bring additional memory cards, batteries and any other extras you will need. Disposable waterproof and panorama cameras are also a fun option. You are welcome to recharge your camera at night (at the OARS American River Outpost only) once all activities have concluded. Once you are on the river there is limited communication with the “outside world.” Cell phone service is not usually available during the day while on the river, but at the OARS American River Outpost, there is service for most phones. If you have someone that needs to contact you about an emergency at home and they cannot reach you on your cell phone, they should call our office (800-346-6277). For your family at home, you should define for them what you consider an emergency and provide them with instructions to call our office in the event one occurs during your school. You may want to check one week prior to your trip for an up-to-date weather forecast. For weather in Coloma, CA, we recommend the following website: www.wunderground.com. Spring snow melt in the mountains provides us with the water to have our fun rafting the Sierra Nevada’s rivers. Water levels sufficient for rafting on the South Fork during the summer months are a result of releases from hydroelectric facilities located upstream. When spring run-off is highest, water is released from the reservoirs in abundance to make room for the in-flow. This can lead to high flows on our trips. Peak run-off can vary widely from April into June. High water trips equate to a more intense whitewater experience; a high level of physical fitness is recommended. Water temperatures are coldest during the high water period and wetsuits will be required. In reality, the water is quite cold even in late summer, but lower flows and warm air temperatures mitigate the risk of hypothermia. During the day—Start with a swimsuit and/or swim trunks and synthetic or merino wool shirt as a base layer. At minimum, a wetsuit (provided) is required to be worn while on the river. Depending on the weather, temperature and how wet you’re getting in the rapids, additional layers for sun protection or insulation can be added or subtracted. In camp—When the weather is warm, a pair of lightweight cotton pants or shorts and a shirt make great camp wear. Anytime the forecast calls for cool evenings and cold nights, a dry set of synthetic long underwear is the perfect base layer under long pants and a fleece sweater. During the day—The best choice is an amphibious shoe that drains water, protects your toes and won’t come off in swirling current. A retired pair of athletic shoes can work well, too. Sport sandals with a heel strap are a good option. Find professional-grade options made by Chaco® at www.chacos.com, the official footwear sponsor of OARS guides. In camp—We recommend wearing shoes in camp due to risk of kicking a rock buried in the sand, or stepping on a sharp stick. It’s also nice to put on dry socks and shoes after a day on the water. The athletic shoes or light hikers you bring for hiking can double as your camp shoes. Flip flops or slip-on sandals are OK for wearing in camp only. During the day­—Ball caps are useful since they fit under helmets, which are required attire when paddling our whitewater rivers. A good way to keep cool is with a sarong or a long-sleeved cotton shirts. Old collared dress shirts work well. They can be soaked in the water and worn in the raft or carried on a hike for later use. This method of evaporative cooling is very effective. Bandanas are another useful item that can be used in this manner. Synthetic or merino wool long underwear is a must-have on river trips. It can be worn under shorts, rain gear, T-shirts, etc., then stripped off when the chill of the morning has worn off. It keeps you warm even if it’s wet (which can happen easily), dries quickly, and it’s compact enough to be stuffed into your small waterproof bag or daypack after you take it off. It can be layered under your waterproof rain jacket and pants. In cooler weather, a rain jacket and pants can work better than a wetsuit. This is because the jacket and pants can be put on when it’s cold or when you’re going through whitewater then easily taken off when the sun comes out and it’s hot. On early-season and high-water trips, wetsuits will be provided. Be aware that cotton items, once wet, do not insulate; only synthetic and wool materials will keep you warm during cool, wet weather. ☐ Small waterproof bag to be used on the raft during the day to hold items such as: raingear, camera, sunscreen, lip balm, etc. This bag should have a clip or carabiner to attach it to the raft. Find all the gear you need for your trip online in the OARStore (http://oars.newheadingsllc.com/) and receive FREE SHIPPING in the U.S. + 15% of your purchase helps provide under-resourced youth with outdoor adventure experiences. You may find it convenient to pack your gear in a soft duffel bag. If necessary, you can pack that bag into an OARS-issued dry bag. You may also find it convenient to bring a small, waterproof bag for day use. Here you can keep items such as: raingear, camera, sunscreen, lip balm, etc. Please pack light; river attire is very casual―comfort, convenience and boat space takes precedence over style. At the end of the school you will be returned to the OARS American River Outpost. Here, you can pack up your gear for your return trip home. If you have extra luggage, it should be locked in your car. We recommend that you leave your valuables at home. For personal items like wallets, purses and cell phones, we recommend leaving them in your car. In reviewing your statement, you’ll note a $1/person/day donation to the American River Conservancy, a non-profit conservation organization dedicated to protecting the Forks of the American River. One-hundred percent of your tax-deductible donation goes toward conserving the American River watershed. See www.arconservancy.org for more information. This donation is voluntary and may be removed from your invoice if you choose not to participate. Please notify our office if you would prefer to delete the donation from your balance. As the paddle sports industry evolves, working within the rafting industry has become increasingly competitive. Attending an OARS guide school can be a critical first step to river guiding and may provide an opportunity for employment either with OARS or with a different outfitter. If you are interested in river guiding for OARS, please click here to complete our online guide application. We do give preferential consideration to our guide school graduates. OARS. West, Inc. and cooperating agencies act only in the capacity of agent for the participants in all matters relating to transportation and/or all other related travel services, and assume no responsibility however caused for injury, loss or damage to person or property in connection with any service, including but not limited to that resulting directly or indirectly from acts of God, detention, annoyance, delays and expenses arising from quarantine, strikes, theft, pilferage, force majeure, failure of any means of conveyance to arrive or depart as scheduled, civil disturbances, government restrictions or regulations, and discrepancies or change in transit over which it has no control. Reasonable changes in itinerary may be made where deemed advisable for the comfort and well-being of the participants, including cancellation due to water fluctuation, insufficient bookings (this trip requires a minimum of 6 students), and other factors. There is risk in whitewater rafting, particularly during high-water conditions. Rafts and kayaks can capsize. You could be swept overboard. Your guide will make every attempt to assist, but you must be strong and agile enough to “self-help” and “float-it-out” without further endangering yourself or others. We reserve the right not to accept passengers weighing more than 260 pounds or with a waist/chest size exceeding 56 inches. We may decide, at any time, to exclude any person or group for any reason we feel is related to the safety of our trips. We are experienced at accommodating people with various disabilities. Please give us an opportunity to make you feel welcome. We need to discuss any special requirements ahead of time. On advancement of deposit the depositor agrees to be bound by the above recited terms and conditions. Prices subject to change without notice.